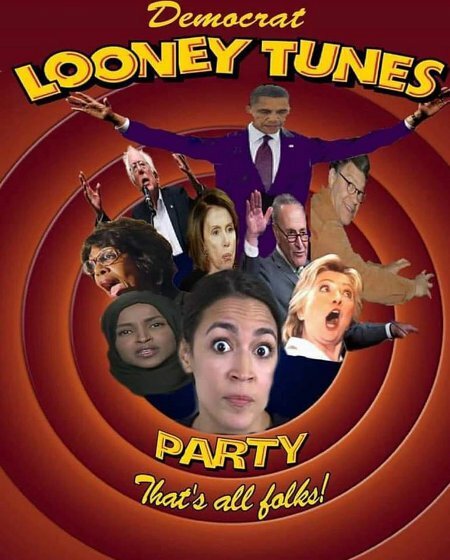 Even the oddest reaches of Tex Avery’s mind didn’t come up with the surreal levels of madness that is endemic today among the Democrat politicians and so many of their constituencies. No; what we have now is what amounts to twisted parodies of characters from late-night Cartoon Network shows. This entry was posted on Saturday, March 16th, 2019 at 12:24 pm and is filed under Politics. You can leave a response, or trackback from your own site. I love the graphic. I grew up on looney tunes. AOC is really taking that party to the outer limits of leftism.